Powerful, Simple, Easy to Use. What is an Insurance Agents Work Unit? This Insurance agents selling tip shows how to use the insurance agents work unit. This insurance agents work unit is a simple method to help you develop a successful format to aid you in reaching your income goals every week. Below is a picture of what I refer to as a work unit. Most new and many existing insurance agents don't have the knowledge and/or the experience to develop a successful business model. To be successful you must first learn how to develop and manage a system for each and everything you do such as prospecting, phone calling, running the interview, getting referrals, etc. Creating a success formula is really learning how to develop a series of systems and putting them all together for maximum efficiency. Using this insurance agents work unit, which is shown above, is just that. a system to determine your activity level that is needed to make one sale. So lets take a close look at an insurance agents work unit. 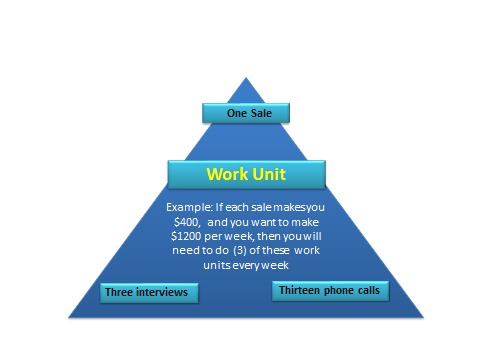 As you can see in this example, a work unit consists of 13 phone (calls), 3 interviews and results in 1 sale. It provides you with a success system to follow. What do we mean by a system? A system is a method that allows you to repeat a successful formula over and over. Just like golf, baseball, bowling or any sports activity, the people that can master and repeat their developed and proper swing over and over become very successful. When you develop a system, you are putting in place something that you will repeat over and over again. In my case, when I eventually created and refined a system that was successful, I let the system dictate to me what I should do. Over time, I created a success system for getting referred leads, opening an interview, recruiting agents, making phone calls, and so on. The insurance work unit shown above is a only one part of a complete success formula. Just as I did with my referred lead card system, No matter what, I would never let anything take me away from making sure I asked for referred leads at the end of an interview, and I had mastered a presentation just for that purpose. How do we come up with the above numbers in our work unit?. They should come from your record keeping. (What are your numbers?) Do you know the average dollar value of each of your sales? If you do not have a record keeping system/ledger to provide you with this information, then somewhere in your training program, someone missed the boat. Subscribe to our website (top right side of this page) if you want to keep updated on bookkeeping and organizational ideas. lets say you were using referred leads. Then the numbers could be 3 phone calls-2 interviews -1 sale, and if the average sale was $500 commission, and if you done three (3) of these work units every week, you would make $1500 per week. Refer to the prospecting ladder article. A lot less phone calls and less interviews to get the same end result. In summary, the work unit is a powerful, yet simple way for you to determine what you need to do each and every week, and is determined by the numbers from your personal record keeping system. If you are honest with the numbers, you will now be able to create a simple system to help meet your income goals, which we call an insurance agents work unit.